These two photos were taken by Patty McKown in 1968 and show the house as it looked at that time. (Left) The Larson Mansion. 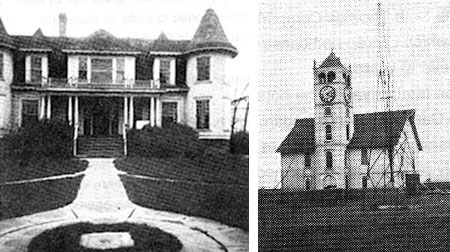 (Right) The Famous Clock Tower Barn that was destroyed by a tornado in 1976. Located on a lonely stretch of highway in eastern Central Illinois is an isolated village called Voorhies. There is very little left of the town these days, save for a few houses, an abandoned church and of course, Voorhies Castle. While most of the stories about the place have died out over the years and the house has become little more than a forgotten curiosity, it was once regarded as one of the most haunted houses in the state. The place became the perfect model for a "haunted house on the prairie". The story of Voorhies Castle began in 1867 with the arrival of a Swedish immigrant named Nels Larson in America. He rented 60 acres of land from a wealthy landowner named William Voorhies and set out on his own. Later, he bought a large parcel of property from his former employer near the small town of Voorhies. Also in 1872, Larson sent for his fiancee, Johannah Nilson, who was still living in Sweden at that time. Later that same year, they were married. Larson continued to buy more land, and lease other parcels and soon had a number of farmers working for him, renting his property in exchange for a portion of the proceeds from the harvest. The small town of Voorhies, which Larson owned, was also growing, consisting of small businesses and tenant homes rented by Larson's farmers. The town also contained a church, a general store, a grain elevator, a corn crib and several barns. There was also a barber shop, a jeweler, a blacksmith and a postmaster. By 1900, Larson was firmly entrenched as the "ruler" of his vast domain, consisting of tenants, farms, land, various businesses and even an entire village. He had lived in several houses around the area, but now decided that he needed a manor house to from which to oversee his property. This house, later dubbed "Voorhies Castle", would be patterned after a chalet in his native Sweden. The house was a strange mixture of styles and eccentricities, with towers, wide doors, a huge dining room, pocket doors, massive fireplaces, two parlors (one for men and one for women), an indoor bathroom, a primitive water and plumbing system that pushed water from the basement using compressed air, a hot air furnace and a lighting system that used dangerous carbide gas. The system was very hazardous and Larson had to obtain special permission from his insurance company to have it installed. Once the system was in place, light fixtures and wall-bracketed lamps were added in most of the rooms. The house would never be equipped with an actual electrical system during the period when the Larson family lived here. The most eccentric addition to the estate came in 1910, as a clock tower barn that Larson insisted be included on the property. The stories say that Larson had a fascination, or perhaps obsession, with clocks. They could be found all over the house, from the large grandfather clock in the reception area to small timepieces scattered on the top of the wooden trunk in his bedroom. One day in 1905, he decided that he wanted to install a large clock in his barn. However, the barn that he now had would not work for this so he ordered it dismantled and sold to a neighbor. He would construct a new barn and place the clock in this one. He ordered a Seth Thomas clock from a jeweler in Monticello and began construction on the new building. The work on the barn took almost five years to complete, even longer than it took to build the house. The new structure had to be equipped with a 68 foot tall tower and had to be given enough support that it could hold the nearly two ton clock mechanism. Legend states that the clock mysteriously struck 13 times at the moment of Nels Larson's death, as though the man and the machine were somehow connected. The stories went on to say that the clock continued this odd activity for five decades, ringing out on the anniversary of its owner's passing. The clock tower remained an odd landmark on the prairie until the summer of 1976, when it was destroyed by a tornado. It has been said that the now phantom clock continues to chime each March 29, at the very hour that Nels Larson passed from this world to the next. The Larson family resided in the house for a number of years and during this time, at least one of the numerous legends of the house began. The stories alleged that Nels and Johannah Larson had another child in addition to George and Ellen Larson. It was said this child was severely retarded and was kept chained in a small, hidden room in the house. It has been said that in later years, visitors to the house claimed to hear the sound of phantom chains rattling inside of the walls. The validity of this story is unknown as volunteers from the Illinois Pioneer Heritage Center searched the house for this room in the 1960's but were unable to find it. The most mysterious event to occur in the house took place in 1914, when Johannah died. Many have speculated that she had a heart attack on the staircase, but the real cause of her death remains a mystery to this day. One of the field hands had gone to the house one afternoon to find her lying in a crumpled heap on the floor. Nels Larson was so stunned by this event that he left the house that night and went to Ellen's home in Cerro Gordo.... never to return. All of the clothing and furniture and even his personal belongings were left behind. He never returned to the house, abandoning everything that had been left there. The house seemed trapped in time with clothing in the closets, the table still set for dinner, Johannah's apron hanging over the back of a chair and even food still sitting on the cold stove. Johannah was gone...but did she ever really leave the house, even after death? Legends stated that on certain nights, an eerie light could be seen coming from the east tower of the house. Those who were brave enough to venture onto the property claimed to see Johannah framed in the window of the room. Nels Larson died in 1923 and his will specified that the house should remain in the family. The problem was that no one in the family wanted to live there because the house had no electricity. So, the house was abandoned and remembered only by time and the elements. Over the years, a number of tenants moved into the house but none stayed for long. It's likely that they were chased away by the deteriorating conditions of the house more so than by the ghosts. However, the rapid succession of tenants and the spooky atmosphere of the place combined to give the Castle a ghostly reputation. The stories grew and became more embellished as the years went by. It was said that someone died of fright in the house and the imprint of his or her body was still pressed into a couch in the living room. There was also said to be a pillar in the west parlor, which once held a large fern, that would inexplicably spin around under its own power. Reports said it spun so much that it eventually wore down into a circular area on the floor. In 1967, the grandchildren of Nels Larson donated the Castle to the Illinois Pioneer Heritage Center in Monticello. The Center opened the house as a tourist attraction, reportedly drawing up to 30,000 visitors each year. They came to view the unique architecture of the place... and to soak up some of the ghostly ambiance. The house was simply too expensive to take care of and after a short time it was closed down once again. The Castle was once again empty, with only caretakers to watch over the house on occasion. The caretakers claimed that the lights in the house refused to stay off and that windows would often open on their own. One of them also claimed that he would often close up the house, turn off the lights and make sure all of the windows were closed and locked. By the time he would get outside to his car, the lights would be on again and several of the windows would have slipped open. Another caretaker reported eerie sounds inside of the house and described them as footsteps on the stairs and the sound of piano keys clinking in the darkness. It was suggested rodents or animals in the house could cause these sounds, but he insisted that this was not the case. He finally quit working there, another witness told me, after he was startled one night by a shadowy figure in the east tower. He was convinced that he had seen a ghost. The odd stories about the house never seemed to stop and it became a favorite "haunt" for late night curiosity-seekers. Many local adults and especially teenagers and college students from Champaign, Mattoon, Charleston and the surrounding area came to Voorhies Castle for after-dark excursions. Many of them claimed to have bizarre experiences and brushes with the supernatural. Many spoke of apparitions, seeing glowing balls of light, sounds that had no explanation, ghostly footsteps, flashlights that suddenly stopped working, and even more. The legends, and alleged eyewitness accounts, concerning Voorhies Castle were enough to attract the attention of a parapsychology group from the University of Illinois. The tales of strange phenomena were just too bizarre, and too numerous to ignore, so they decided to enlist the aid of Chicago psychic Irene Hughes. However, once arriving at the house, she refused to stay inside or to conduct any investigations. The house was eventually sold but over the course of the next few years, it was frequently vacant and began to deteriorate again. The decay of the mansion became the biggest problem that all of the new owners and tenants would face... along with fending off the sightseers, for whom the ghostly landmark was still an attraction. Several of the more recent owners have made valiant attempts to restore the house and have done everything possible to discourage visitors from coming to the house. If you are the sort of reader who likes to experience the haunted places you read about, you may want to give Voorhies Castle a wide berth, as trespassers are usually unwelcome. Voorhies Castle is a private residence but has been recently purchased by a new owner who plans to rebuild the old clock tower and barn and possibly open the home for tours when it is restored. The village of Voorhies is located northeast of Decatur on Highway 105 between Bement and Monticello.